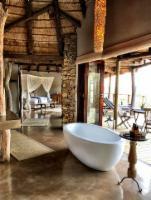 The Nambiti Reserve is a exclusive Big Five bush retreat, in the Malaria Free Nambiti Game Reserve KwaZulu Natal. Boasting incredible biodiversity including Savannah, thornveld, extensive grasslands that mirror the plains of central Africa and the abundance of natural water and the beautiful cascades of the Sundays River makes Nambiti a unique sanctuary for all forms of wildlife. We offer our guests a truly unique experience. Apart from the traditional, open-vehicle safari game drives where the big five and over thirty other species of game including cheetah and hippo can be seen, we can also pre-arrange Battlefield tours should you wish to incorporate it with your safari experience. Our Lodge overlooking the waterhole and plains area make it the perfect vantage point from which to view wildlife in their natural environment. Contemporary, simplistic decor, subtle earthy colors and cozy relaxation areas allow you to experience the African bush at its best. Glassed sliding doors, overhead fans and screeded floors ensure you stay cool in summer while large, beautifully constructed packed stone fire places in our lounge and dining room beckon you to absorb its inviting warmth in winter. Relax either in our lounge, separate bar, outdoor lounge or at the swimming pool which is also a popular drinking spot for the elephants - a fine line between luxury and the reality of the African wild. All seven of our suites are a short walk to the main area, completely secluded and luxuriously appointed, designed and decorated with the utmost care and detail. Enjoy panoramic views from your private deck, while having an indulgent soak in your freestanding tub or even from your indoor or outdoor showers. Each suite is equipped with canopy mosquito nets, overhead fans, tea/coffee stations, safes and mini bars. For families we offer two inter-leading suites, separated by a solid, packed stone wall and leads to two totally separate and private rooms, equipped as the other suites with the exception of outdoor showers. Our chefs will take you on a taste sensation with healthy, scrumptious meals, prepared with the freshest ingredients and is reflective of good Pan African cuisine. Look forward to hearty breakfasts on your return from early morning game drive, light lunches or high teas depending on the season and fabulous three course dinners after your evening game drive. Meals are informal and served either outdoors, in our dining room or under African skies in our outdoor boma around a roaring central fire-pit. Join our qualified field guides as they take you on spectacular game drives. Experience first hand the thrill and excitement of tracking and locating wildlife, learn about the natural flora and fauna and view not only the big five but also cheetah, hippo, a vast array of bird species. You will have the opportunity to learn about the smaller animals, all of which come together to create this beautiful African ecosystem that is unmatched anywhere else in the world. At Nambiti Plains, our emphasis is on absolute personal attention, in being flexible to your needs and to ensure that you, our guest, enjoy the best possible five star experience coupled with superb hospitality and we invite you to join us on a journey where wilderness and civilization meets and creates pure sophistication. Experience the romance, adventure and excitement of Africa at Nambiti Plains Private Game Lodge. We regret no children under 8 years. Nambiti Plains Lodge requires the full accommodation payment in order to secure bookings. Bookings are only confirmed upon receipt of all relevant guest details as well as payment notification. Provisional bookings will be held for a period of 48 hours after which it will be released. Guests are required to settle any extras directly at the lodge... Nambiti Plains Lodge requires the full accommodation payment in order to secure bookings. Bookings are only confirmed upon receipt of all relevant guest details as well as payment notification. Provisional bookings will be held for a period of 48 hours after which it will be released. Guests are required to settle any extras directly at the lodge via cash, Mastercard or Visa credit cards. Child policy: no children under 8, children 12 and over pay full adult rate, no triple rooms. The lodge was amazing, and we received amazing personal service from Betty, Ettiene and Tertius. Would be glad to return to the lodge at any time! Great spacious and luxury accommodation in a pleasant reserve. We had a relaxing time at Nambiti Plains and enjoyed some good interaction with the animals. Nambiti Plains Private Game Lodge is 6.8km from the centre of Nambiti Private Game Reserve , the nearest airport 161.5km (Prince Mangosuthu Buthelezi Airport).